Camvista have just recently launched their Remote Event web-based software application that has been developed for online managing and assisting with monitoring the fastest growing alarm video monitoring security cameras – the Videofied MotionViewer wireless self powered GPRS mobile security systems – manufactured by French company, RSI Videofied Technologies based in Strasbourg, northeastern France. To monitor any of the Videofied security video camera alarm products Alarm Receiving Centres and Monitoring Stations require the FRONTEL software package to monitor all the video alarm alerts from the Videofied surveillance alarm products. Remote Event has been developed by Camvista who work closely with many monitoring stations and alarm receiving centres around the globe to add extra features and camera management functions that works well alongside the FRONTEL monitoring software to give important and valuable additional camera alarm management tools not currently available with FRONTEL for security related companies monitoring the fastest growing video alarm surveillance cameras – the RSI Videofied security video alarm products. 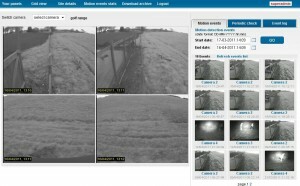 This entry was posted on Monday, May 2nd, 2011 at 9:04 pm	and is filed under Frontel Videofied monitoring software, Remote Event software app Videofied, RSI Videofied MotionViewer security products. You can follow any responses to this entry through the RSS 2.0 feed. You can leave a response, or trackback from your own site.